Federal Environment Minister Jim Prentice has announced he is leaving politics to join the Canadian Imperial Bank of Commerce. 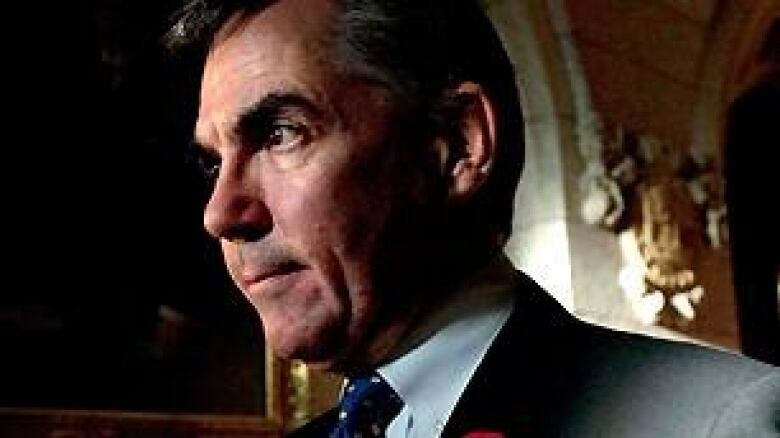 In a surprise move, Prentice, the Conservative MP for Calgary Centre-North, told the House of Commons on Thursday he will leave Parliament to join CIBC as vice-chairman in January. Prentice said he had made a commitment that his time in politics would be limited to eight to 10 years and that the time to pursue other opportunities had come. "I think people should come into public life, serve for a period of time, and then go back to the private sector," Prentice said on CBC's The Lang & O'Leary Exchange. The Prime Minister's Office announced that Government House Leader John Baird would become interim environment minister. Prentice, 54, was widely considered to be one of the most senior and powerful members of Prime Minister Stephen Harper's cabinet and was often mentioned among potential candidates to succeed Harper as leader of the federal Conservatives. While Prentice received handshakes and well-wishes from opponents in the House, his announcement also sparked questions on the Hill about how a sitting senior government minister can negotiate the terms of a job with a major financial institution without creating potential ethical problems. Are there ethical problems with Jim Prentice becoming vice-chairman of CIBC? Take our survey. NDP Leader Jack Layton questioned the "awfully easy access back-and-forth" between the Conservative government and the "upper floors of Bay Street," citing the controversy surrounding Onex executive Nigel Wright being named Harper's incoming chief of staff. "This is the kind of overly close relationship that has Canadians worried," Layton told reporters. Prentice, who met with federal Ethics Commissioner Mary Dawson before making his announcement, will be required to refrain from lobbying the government for the next two years, per the Lobbying Act's "cooling-off period" provisions for former ministers. Prentice told The Lang & O'Leary Exchange that the bank made a firm offer to him late Wednesday afternoon, and that he informed the ethics commissioner and the prime minister Thursday morning. Prentice added that during his time in Parliament he had no dealings with the bank. The Ontario-born lawyer previously ran for the leadership of the Progressive Conservative Party in 2003, losing to Peter MacKay. The Progressive Conservatives and the Canadian Alliance merged in 2004 to form the Conservative Party of Canada. Shortly after Prentice spoke in the House, the prime minister rose to wish Prentice the best in his future endeavours. "In all of these functions, he has earned the highest respect not just of me and his colleagues in government, but all of his colleagues in Parliament and all Canadians," Harper said. Prentice's opponents in the three opposition parties also paid tribute to him, despite their political differences. Liberal House Leader David McGuinty, formerly his party's environment critic, called Prentice's departure a "loss" to the cabinet and to the government. NDP national resources critic Nathan Cullen said Prentice was a key minister and "not someone easily replaceable." Cullen also praised Prentice's decision this week to reject the Taseko Mines Ltd. project in British Columbia's central Interior because of its adverse environmental impact and the damage it would cause Fish Lake and dozens of connecting streams. Outside the House, Liberal foreign affairs critic Bob Rae said Prentice was a competent minister "in a government without any environmental policies." "It must be a little lonely and difficult," Rae quipped to reporters. Prentice was first elected as an MP in 2004 and was named to Harper's cabinet in 2006 as minister of Indian affairs and northern development. He moved to the environment portfolio in 2008 after a year as industry minister.